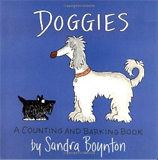 Doggies is another of the Boynton books that is short enough to hold even the littlest guy’s attention, and begs for interaction. Even children who are not yet speaking may find themselves howling at the moon with the doggies. 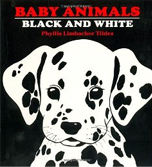 Baby Animals Black and White is a fun board book for the youngest set. Hand, Hand, Fingers, Thumb is a madcap band of dancing, prancing monkeys explain hands, fingers, and thumbs to beginning readers. Big Enough for a Bed – Elmo is too big for a crib! He’s ready to sleep in a big kid’s bed! It may take a little while, but with his favorite snuggly blanket and his teddy bear David by his side, soon Elmo feels comfortable in his new bed. The Carrot Seed Board Book is a timeless classic that has been known and loved by children and parents for years. Look, Look! is a sturdy board book, full of high-contrast black-and-white cut-paper art perfect for staring at, is just the thing for the eyes of the youngest babies. Blue Hat, Green Hat provides serious silliness for all ages. Artist Sandra Boynton is back and better than ever with completely redrawn versions of her multi-million selling board books. The Pooh Library original 4-volume set deserves a prominent place on your bookshelf. Winnie-the-Pooh and his friends–blustery old Owl, bouncy Tigger, clever Christopher Robin, glum Eeyore, and the rest – have been a staple of children’s literature for over 70 years. Read favorite stories again & again. Seek out books about things your toddler likes. 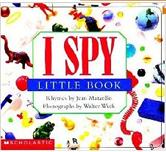 These books may extend a toddler’s attention span and build enthusiasm for reading. Big Bird and his pals are featured in this giant (16” x 24”) board book, Big Bird’s Big Book. Six colorful panoramic scenes teach important early learning concepts: counting, naming colors, opposites, and more. 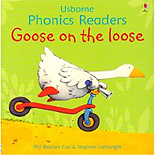 Goose on The Loose is an easy to read book with lots of fun rhyming. For the fanciest girl around, the outdoors are out of this world! Fancy Nancy: Explorer Extraordinaire! and her best friend, Bree, set out to explore the fascinating world of wildflowers, trees, leaves, birds, and, of course, butterflies in their exclusively glamorous Explorers’ Club. Morris the moose has an exciting day in school learning the alphabet, counting, singing, spelling, and doing other things that make him a unique moose, in Morris Goes to School. 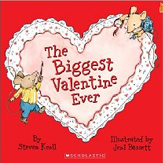 The Biggest Valentine Ever is a nice little story for children about working together, that is set nicely during Valentine’s Day. The Toddlers Busy Book contains 365 activities (one for each day of the year) for one-and-a-half to three-year-olds using things found around the home. It shows parents and day-care providers how to prevent boredom during the longest stretches of indoor weather with ideas for indoor play, kitchen activities, and arts and crafts projects. 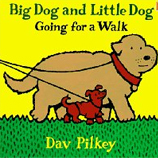 Big Dog and Little Dog Going for a Walk will delight young readers when they go on a walk with their owner and get into some trouble. I Don’t Knuffle Bunny is a Caldecott Medal-wining story about father-daughter trip to the Laundromat and a stuffed bunny put into the wash by mistake. Ladybug Girl and Bumblebee Boy save the playground from hairy monsters and big mean robots, and have their very own parade on the bouncy dinosaurs. Howard B. Wigglebottom Learns to Listen is an excellent teaching tool for children on the importance of good listening habits.